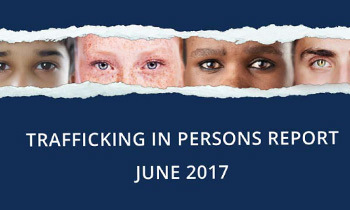 Sri Lanka was upgraded to Tier 2, the annual Trafficking in Persons Report (2017) released by the US State Secretary Rex W. Tillerson said. The report stated that the Sri Lankan government demonstrated increasing efforts compared to the previous reporting period and therefore, Sri Lanka was upgraded to Tier 2. However it said, Sri Lanka did not fully meet the minimum standards for the elimination of human trafficking, however, it was making significant efforts to do so. “The government demonstrated increasing efforts by establishing new anti-trafficking units and creating a Special Police Division for the protection of witnesses and victims of all crimes. While respecting due process, the report recommended Sri Lanka to improve efforts to investigate and prosecute suspected traffickers, including complicit officials, and convict and punish offenders with sentences commensurate with other serious crimes. “While official complicity in human trafficking persisted, the Government investigated 18 officials for allegedly creating fraudulent documents to provide workers employment abroad, and it prosecuted and convicted more traffickers than in the previous reporting period,” it said. However, the Sri Lankan Government did not meet the minimum standards in several key areas. At times, the government’s inconsistent identification of victims resulted in the penalization of victims for prostitution and for immigration violations committed as a result of the victim’s subjection to trafficking,” the report added. “The Government provided no specialized services to male victims and sometimes housed child victims in Government detention centers. The Government maintained specific requirements for migration of female migrant workers including those migrating for domestic work, which observers stated increased the likelihood women would migrate illegally and therefore heightened their vulnerability to human trafficking. Tier one Countries are whose governments fully comply with the Trafficking Victims Protection Act’s (TVPA) minimum standards. Tier two countries are whose governments do not fully comply with the Trafficking Victims Protection Act’s (TVPA)’s minimum standards, but are making significant efforts to bring themselves into compliance with those standards. Earlier Sri Lanka was below that which is Watch List. There are countries through who do not comply with these regulations.